NASCAR attendance and tv viewership has declined in recent years, like the ratings in most US sports have. NASCAR driver Elliott Sadler claims live NASCAR events would draw twice the crowd if organizers opened sportsbooks at the race sites. At a time when NASCAR has declining ratings, Sadler believes sports betting would rejuvenate the sport. The 43-year old Elliott Sadler is a current NASCAR Xfinity Series, but he raced on the Sprint Cup Series (Monster Energy NASCAR Cup Series) for a decade and a half. Sadler made the comments while preparing for a race in Indianapolis. His comments come months after the U.S. Supreme Court repealed the Professional and Amateur Sports Protection Act (PASPA), which banned sports betting in 46 US states for the past quarter century. In the months since PASPA was overturned, three US states (Delaware, New Jersey, and Mississippi) legalized single-event sports bets at land-based casinos. Financial analysts believe sports betting will boost overall interest in US major sports, which should lead to increase tv viewership. Elliott Sadler’s theory that live racetrack betting would boost attendence gets a test in four weeks at Dover, Delaware. One problem with Sadler’s theory is the lack of legal sports betting in the American south, where so many NASCAR races are located. Many midwestern states like Indiana, site of the Brickyard 400, also do not have legal gambling. An 18-wheeler with betting lines would be illegal at most NASCAR racetracks. Unless a number of states surprisingly legalize sports gambling, the bump will not happen. Fan interest could increase in an indirect way, as sports bettors in Nevada, Pennsylvania, Nevada, Mississippi, and Delaware are more likely to watch races they have wagers on. That does not help the NASCAR Xfinity Series’s biggest problem: live attendance. When the Brickyard 400 began in 1994, it was one of the toughest tickets in town. From 1994 to 2008, attendence at the NASCAR minor league event often topped 250,000. 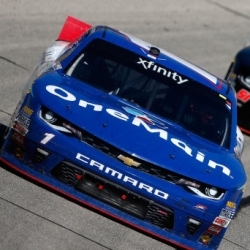 The Xfinity Series is where young up-and-coming racers gain a reputation and attract a racing team for the Monster Energy NASCAR Cup Series, which is considered the major league. In 2008, the Brickyard 400 was marred by tire wear, which led to a series of roughly 10-lap shootouts. Since then, interest in the race has waned. Some years, people have counted as many as 200,000 empty seats. To change the dynamic, NASCAR moved the race from July to September, to avoid the summer heat. A September run time brings problems of its own, though. The Brickyard 400 will run this year during the first weeks of the NFL season. The Indianapolis Colts have a new coaching staff and get back star quarterback Andrew Luck from a season on the IR. Going against the NFL on television and at the live gate is daunting. Which is why Elliott Sadler suggests legal sports betting at NASCAR events. The argument goes for NFL football, MLB baseball, and NBA basketball as well. People would attend more Colts and Pacers games, if they had money on the line. While one might wonder why that is, it’s in the way of things to have more interest in an event if one has a personal stake in it. That is why fantasy football owners are so obsessed with who scores a touchdown; it validates their own pride that they know about NFL football and can predict it. Put another way: sports betting gives a fan a rooting interest. If you are not a Colts fan (or any NFL team fan), if you put a wager on a game, you suddenly become a fan of that team. If a viewer does not care who wins or loses, it is like watching a movie where you do not care about the characters. If you have investment in the story’s characters, you could not care less how the movie ends. Betting on the Brickyard 400 naturally would give many Indiana residents more than a casual interest in the race, which would help attendance and tv viewership.